Two Attucks alums: Oscar Robertson and Hallie Bryant. A photo of a photo on Bryant's wall at home. 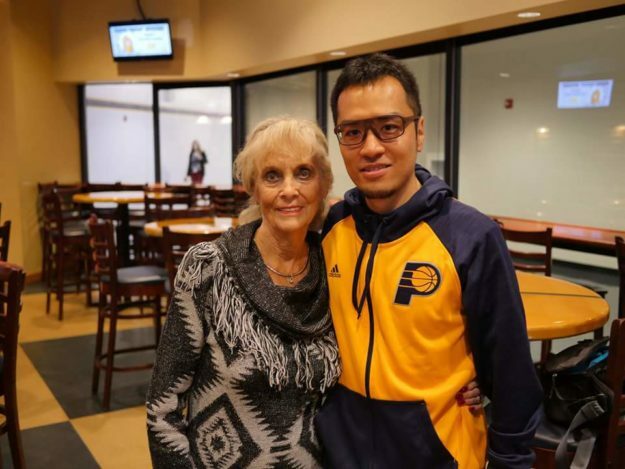 Yu Sakagami comes to a Pacers game every season from Japan, where he works as a translator. He was inspired to learn English after watching Reggie Miller play for the Pacers. He met Nancy Leonard before a game in 2017. 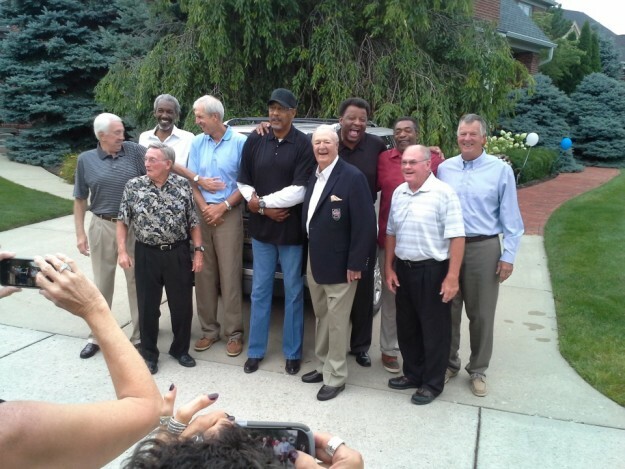 Slick Leonard was close friends with Ralph Beard, who played for the Indianapolis Olympians. 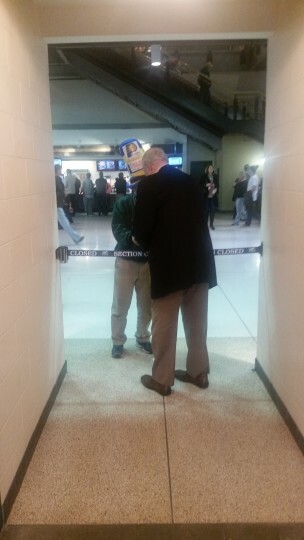 Here he meets with Ralph's son and daughter before a Pacers game in the 2017-18 season. 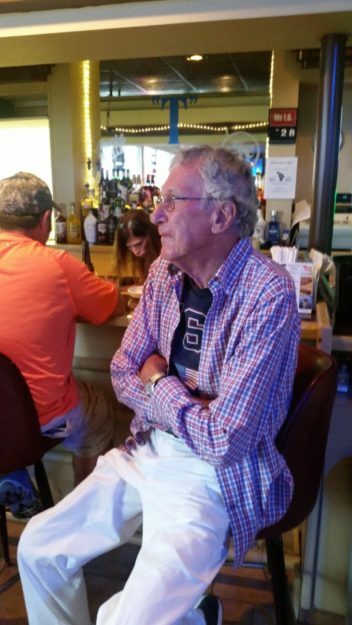 This man, Dr. Richard Bennett of Pennsylvania, has attended every Indianapolis 500 since 1939. 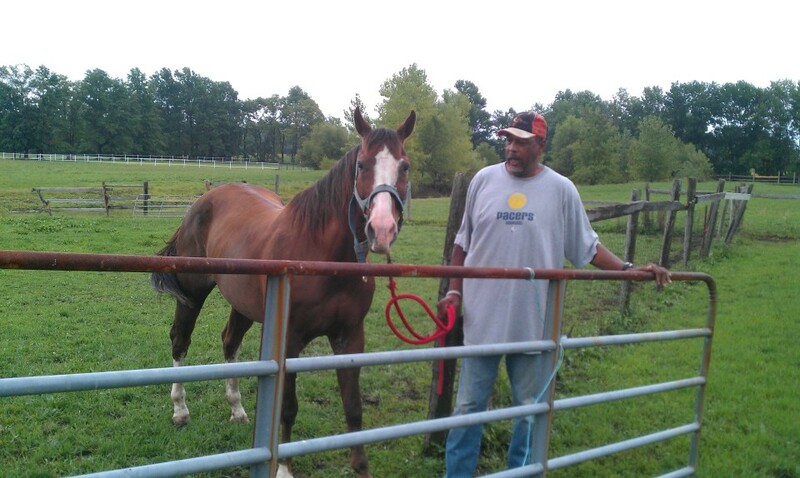 I drove to New Castle to meet him and his traveling party before the 2016 race. He's featured in a One on One episode on this site. Pacers from the Sixties attended the Decade Night during the 2016-17 season. From right: Oliver Darden, Jerry Harkness, Ron Kozlicki, Jimbo Rayl (son of Jimmy Rayl), Tom Thacker, Bob Netolicky, Freddie Lewis, Lewis' son, and Jeannie, the wife of Roger Brown. I organized a mini-reunion for some ex-Pacers a couple of days before the Indianapolis 500 in 2017. 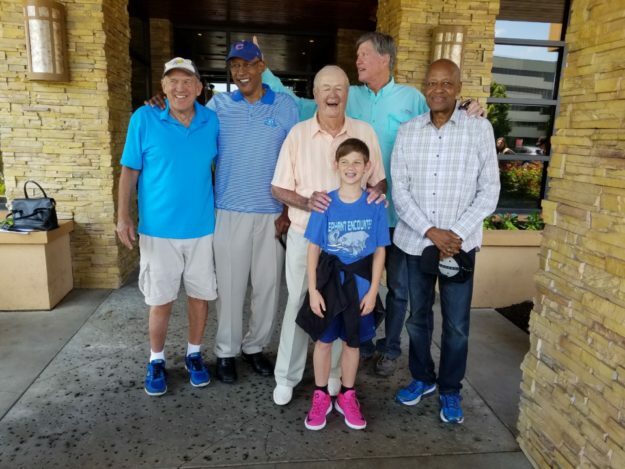 From left: Steve Chubin, George McGinnis, Slick Leonard, Bob Netolicky and Jerry Harkness. The kid in front is Jacob, Chubin's grandson. I have One on One episodes on this site for everyone pictured (except Jacob). Two former Evansville All-Americans, Don Buse and Larry Humes. 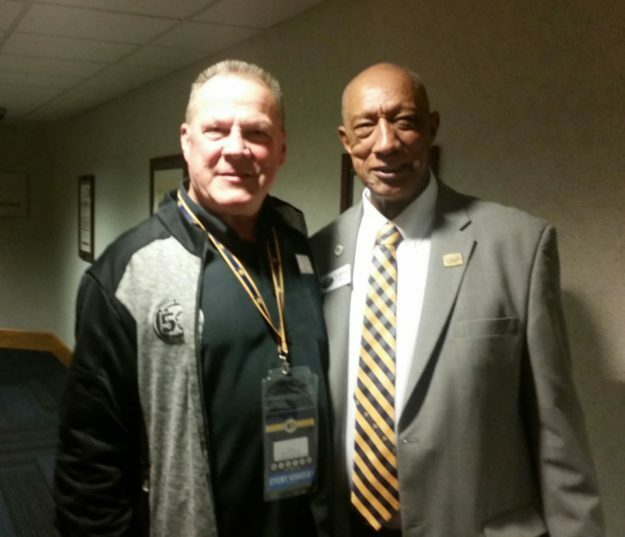 Buse played seven seasons for the Pacers while Humes was the last player cut by the Pacers in 1967. He now works as an usher at games. 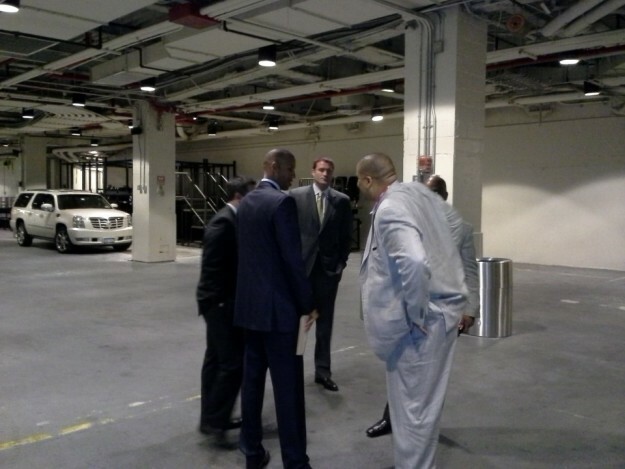 Reggie Miller, back in Madison Square Garden before a Pacers playoff game in 2013. That's his former teammate Austin Croshere in the background and sportswriter Marc Spears on the right. 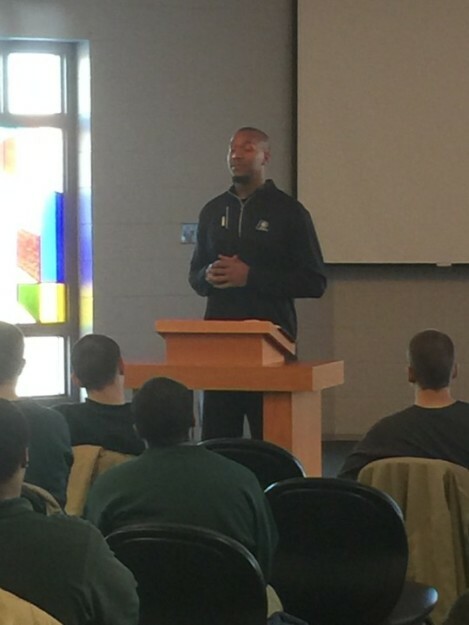 David West visited the Pendleton Correctional Facility to talk with the juvenile inmates. I was allowed to tag along. He gave an impressive speech, full of practical wisdom. My account of this visit can be found on this website, under "Stories." 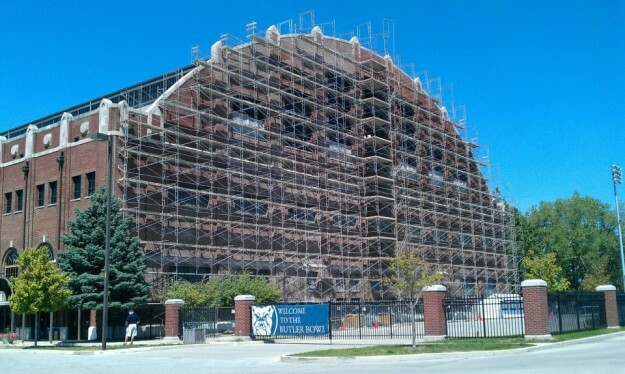 I dropped by Hinkle Fieldhouse one Sunday during its renovation. It's merely the nation's most historic basketball facility, given the number of great players who have run up and down its court since 1928. I took this shot of two former One on One guests in 2016. Hallie Bryant and Greg Bell were ready to head down to IU for the Hall of Fame induction ceremony. Both were already members. This was shot in Bryant's home. 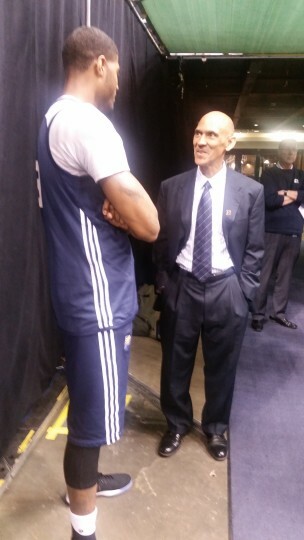 Former Colts coach Tony Dungy dropped by a Pacers practice in the 2015-16 season and chatted with Paul George. 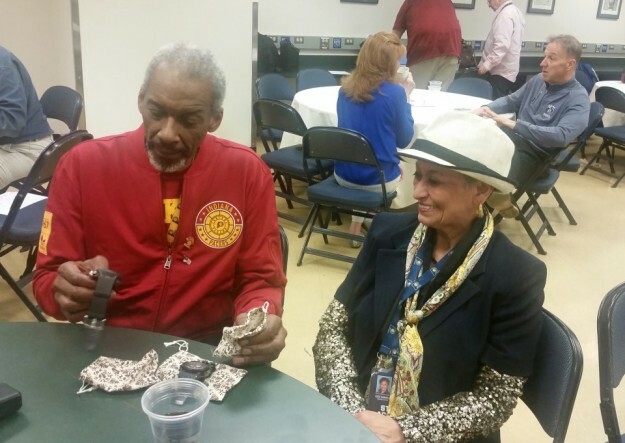 CeCe Daniels brought some of her husband Mel's watches to a Pacers game in 2016 to offer one to former Pacer Darnell Hillman. He took a yellow one. 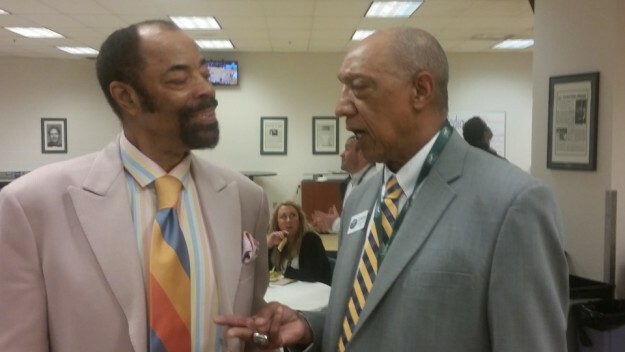 Former opponents Walt Frazier and Larry Humes renew their acquaintance before a Pacers game in 2016. 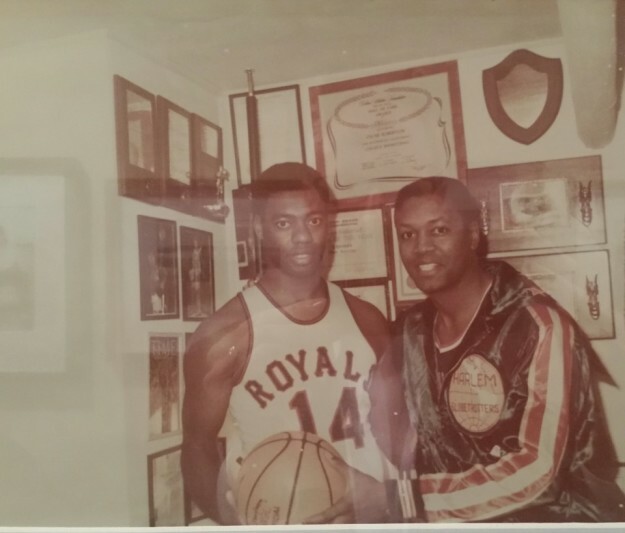 They played against one another in college, Frazier at Southern Illinois and Humes at Evansville. 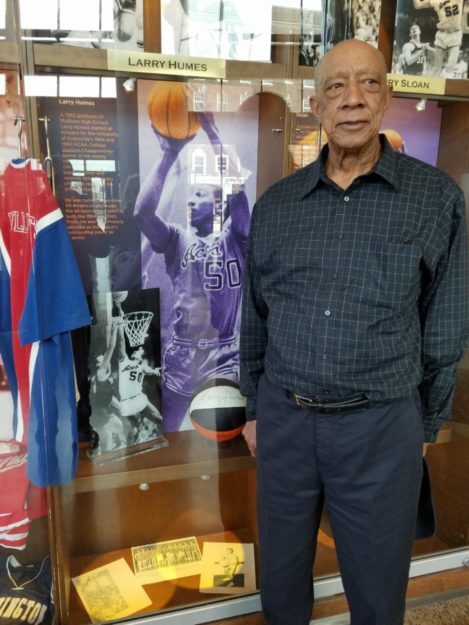 Frazier went on to become an NBA Hall of Famer while Humes was one of the final players cut by the Chicago Bulls and Pacers. Frazier is now part of the Knicks broadcast team while Humes works as an usher at Pacer games. 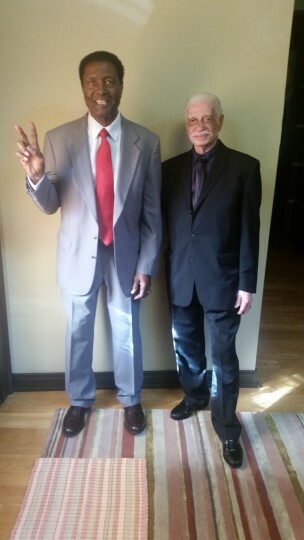 Larry Humes accompanied me to Evansville for a book signing. We stopped by the Ford Center, where one of the display cases honors his All-American career there. 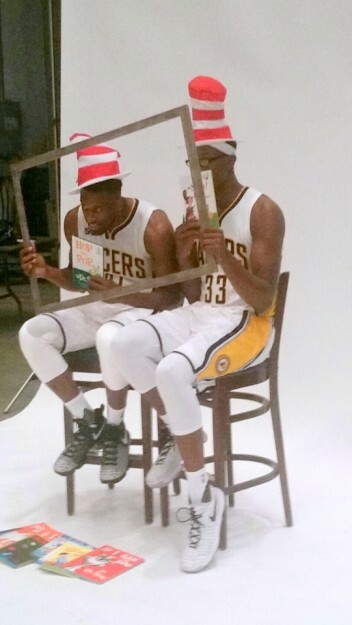 Thad Young and Myles Turner perform Media Day duties in 2016. 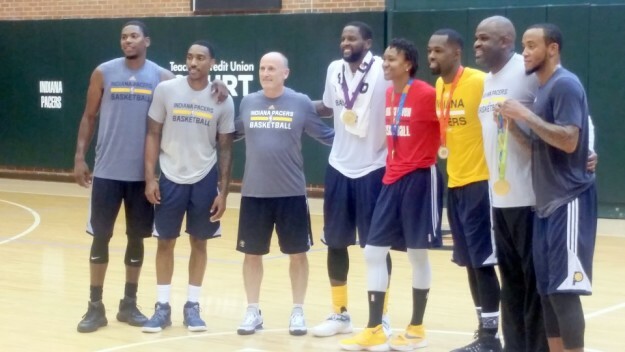 Tamika Catchings and her Olympic gold medals pose with some Pacers following one of their September workouts, a couple of days before her final game with the Fever. Left to right: Glenn Robinson III, Jeff Teague, Dan Burke, C.J. Miles, Catchings, Rodney Stuckey, Nate McMillan and Monta Ellis. 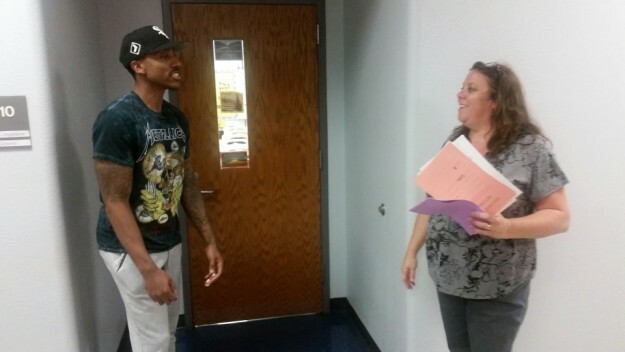 Jeff Teague visits his former Latin teacher at Pike High School. I took Latin at Pike back in the day, and was surprised to learn it was still taught there. Jeff Teague talks with his favorite former teacher at Pike High School, Geometry teacher Miss Guimond. He hated the class at first. She promised to get him a girlfriend if he got a good grade. He got a B. Then she told him he didn't need help, he was a basketball star. Three original members of the Pacers' stat crew. From left to right: Bill Bevan, crew chief Bill York, and Bob Bernath. They were working games when the franchise began in 1967, although Bernath officially joined the crew the following season. 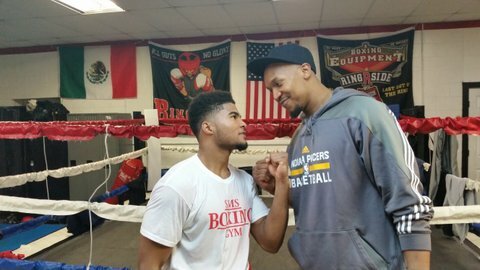 Local boxer Anthony Sims at his gym, mugging with David West. 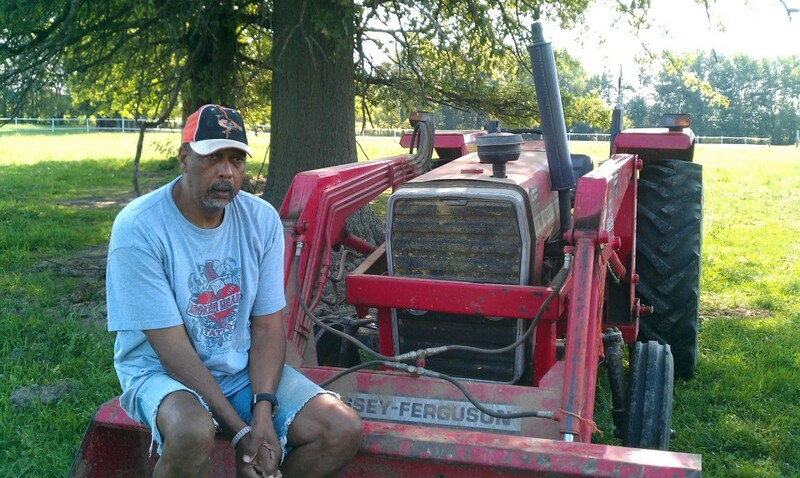 Mel Daniels, on his ranch in Sheridan. 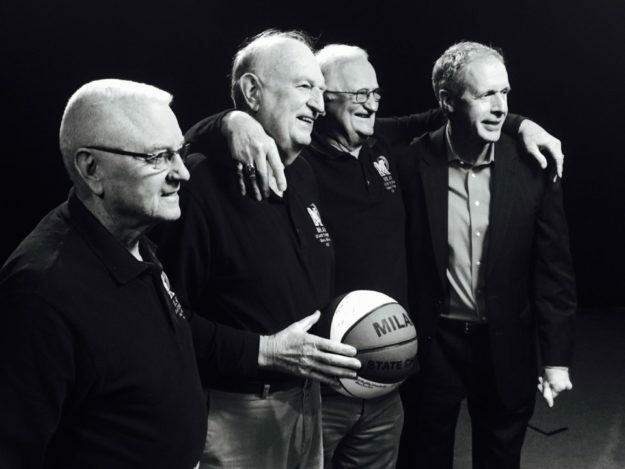 Three Mr. Basketballs: Bill Keller ('65), Denny Brady ('64) and Billy Shepherd ('68). Bobby Plump and the man who was defending his legendary game-winning shot in the 1954 state championship game, Jimmy Barnes. A photo of a photo in Plump's collection. Not from my cell phone, but from somebody else's while I posed with three members of Milan's state championship team after recording a show for public television. 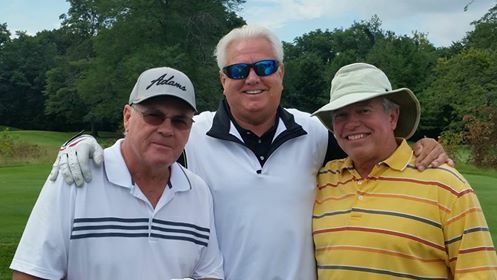 From left: Ray Craft, Gene White and Bobby Plump. 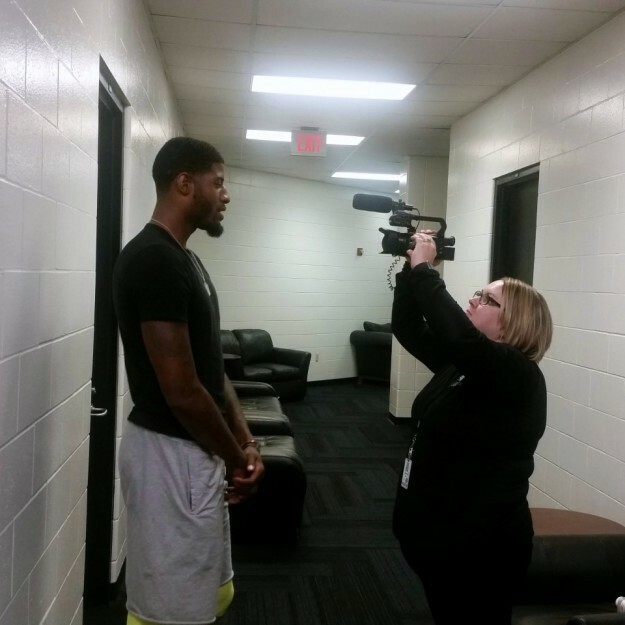 Paul George recording a message for Tamika Catchings two days before her final game with the Fever in 2016. Celeste Bayou works the camera. Attitudes change quickly in the NBA. Paul George was greeted with signs such as this one when he returned to Bankers Life Fieldhouse with Oklahoma City in 2017. I've never asked someone to take a picture of me with a "celebrity," but my wife took this one anyway at a charity event in the summer of 2015. I'm glad she did. Not the greatest quality, but it will have to do. I didn't ask for this one to be taken, either, but didn't object when I was asked to do it. For people my age, Rick Mount was as big a star as the state of Indiana has ever had. 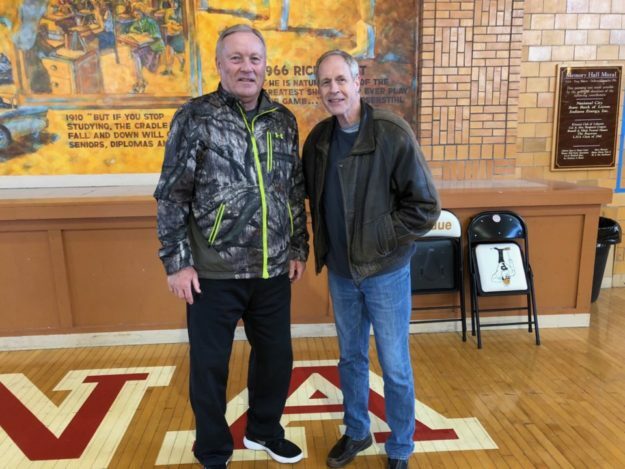 This was taken at the old Lebanon High School gym, where he played. 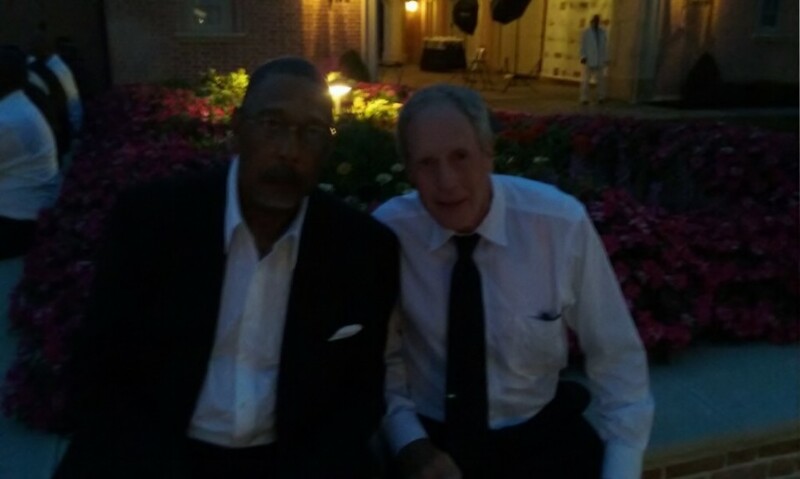 He was Mr. Basketball in 1966 and a Sports Illustrated cover subject. 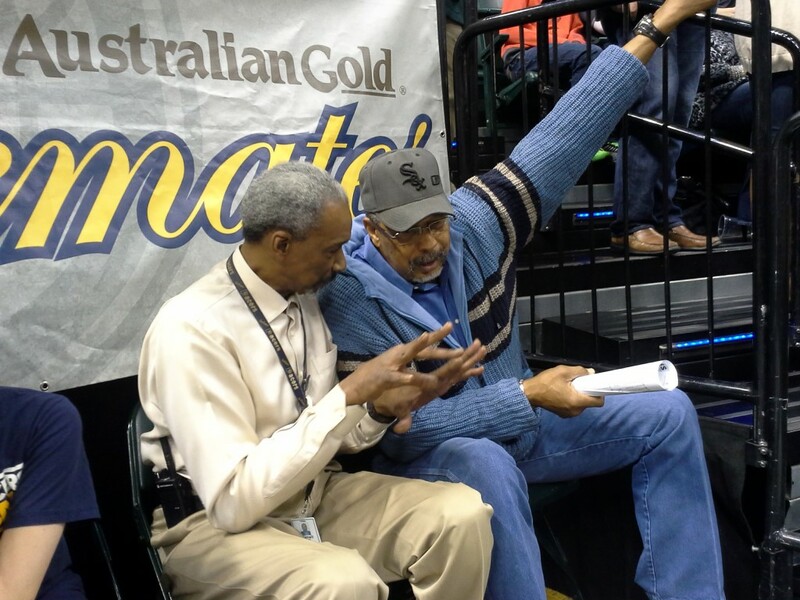 Former teammates Darnell Hillman and Mel Daniels, hardly paying attention at a Pacers game. 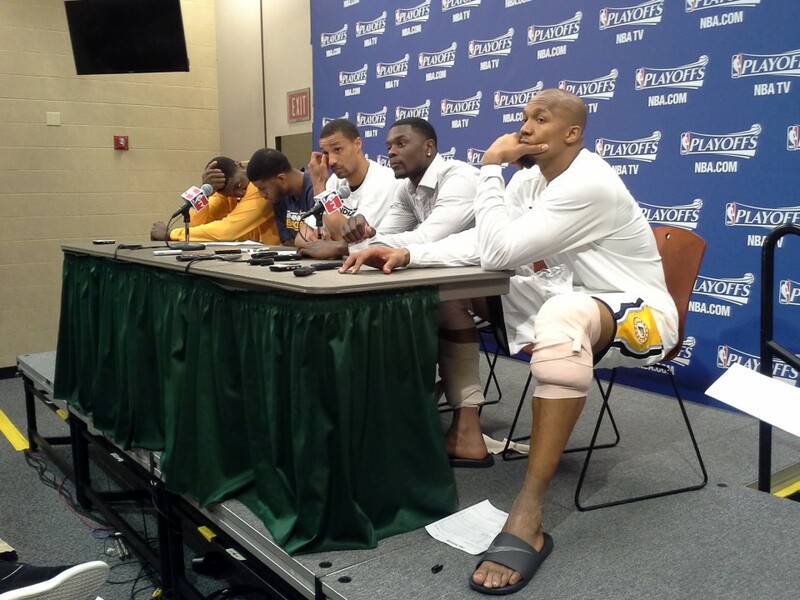 The Pacer starters attend the postgame press conference together after eliminating the Knicks in 2013. This turned out to be the peak moment for that promising team. All five players had been the scoring leader in at least one game in the series, and their togetherness and chemistry were never better. Former Pacers trainer David Craig working on former Purdue star Rob Hummel the summer before Hummel's first pro season. Purdue players on a happy ride home following a win at Penn State. Mel Daniels with one of his beloved horses. 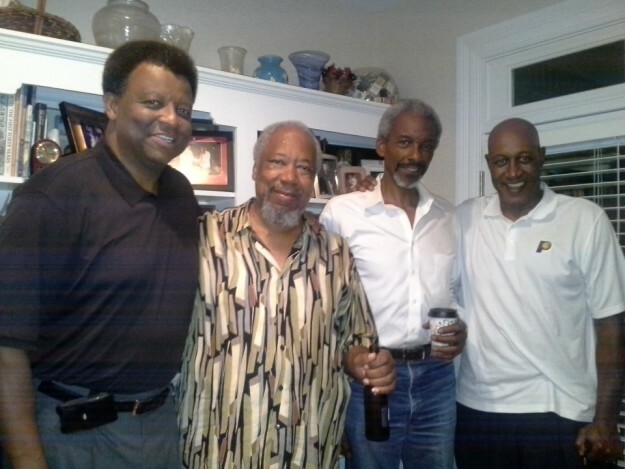 Ex-Pacers Billy Knight (1), Darnell Hillman (3) and George McGinnis (4). The man second from the left is McGinnis' cousin, also named George. 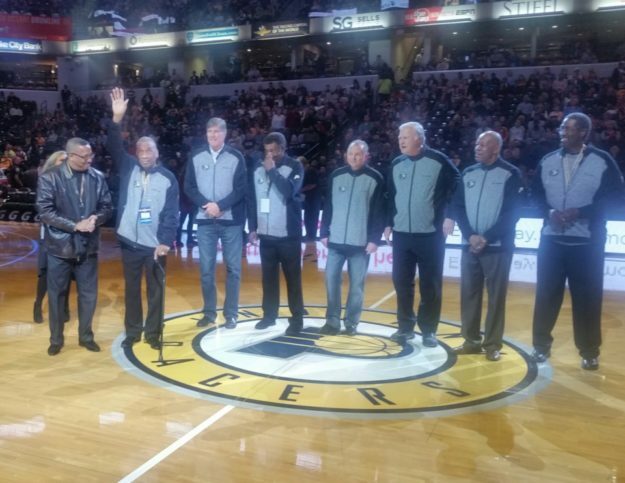 People formerly associated with the Pacers gather to honor Slick Leonard before his induction into the Hall of Fame in 2014. 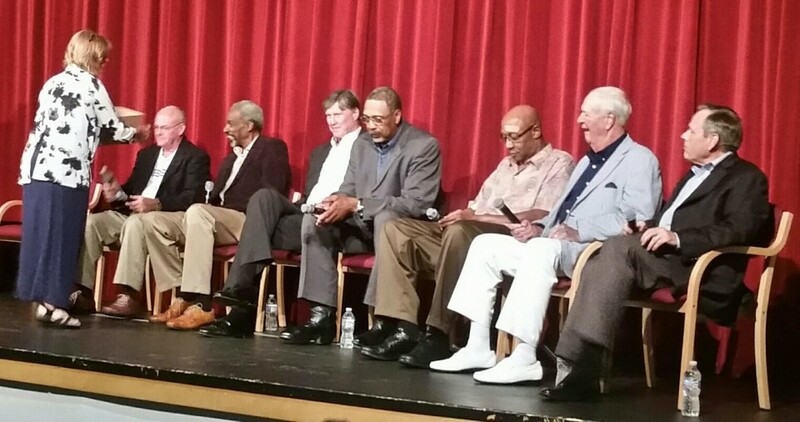 From left to right: Jerry Baker, Jerry Oliver, Darnell Hillman, Bill Newton, Mel Daniels, Slick Leonard, Billy Knight, Tom Thacker, Billy Keller. I'm not sure of the identity of the man on the right. 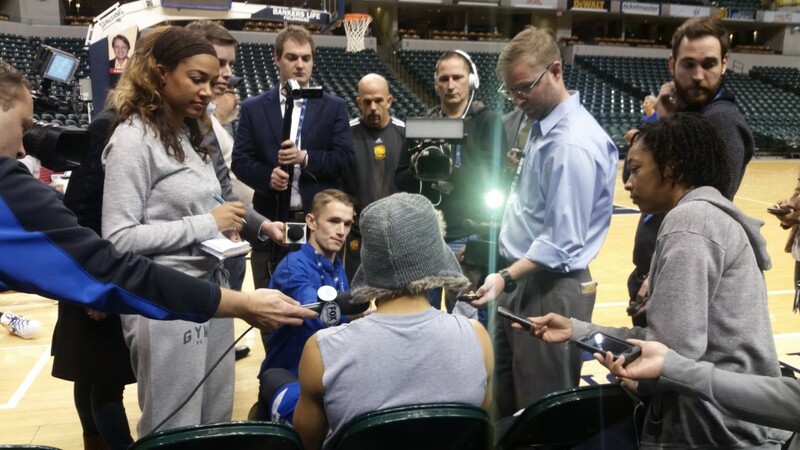 Golden State guard Steph Curry meets the media following the morning shootaround the day his team met the Pacers here in 2015. The bald man standing in front of him is Warriors media relations director Raymond Ridder, one of the all-time greats of his profession. 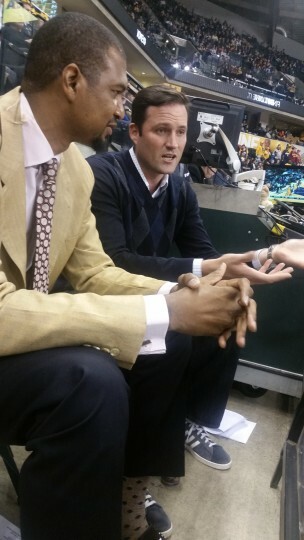 Former teammates Jonathan Bender and Austin Croshere talk during a recent Pacers game. Croshere was in town for a few days with his wife, an Indianapolis native. 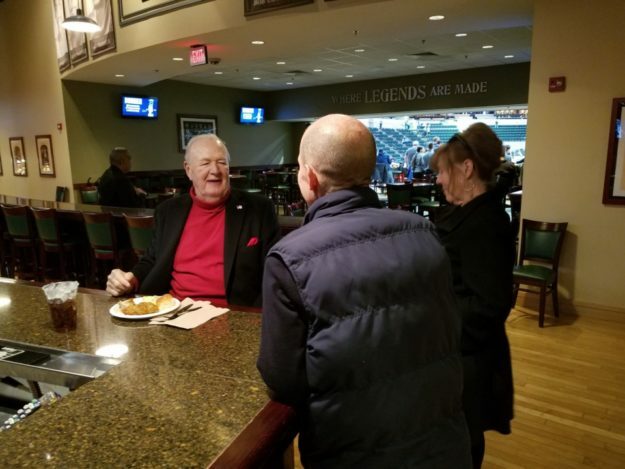 Slick Leonard signing an autograph during halftime of a Pacers game. He does a lot of this before, during and after games. 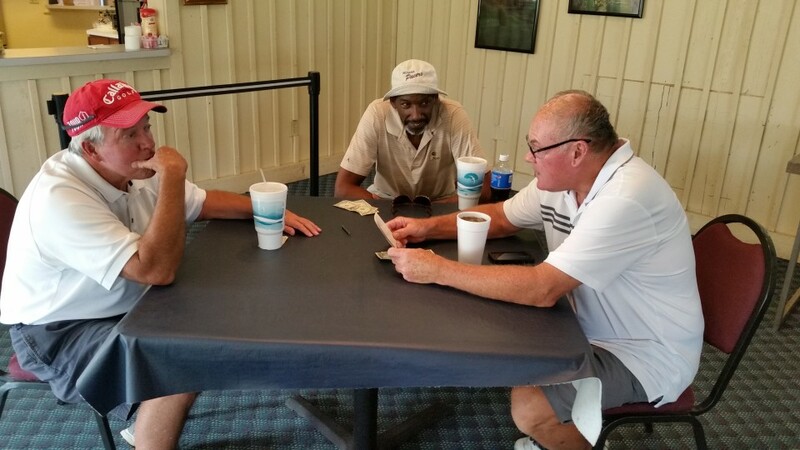 Billy Shepherd, Darnell Hillman and Billy Keller check the scores after a round of golf at Bear Slide. Shepherd won all the money. Shepherd was Mr. Basketball in 1968, Keller in 1965. Hillman is a former Pacer. Members of the ABA Pacer teams gather for a fundraiser in the summer of 2015. Billy Keller, Darnell Hillman, Bob Netolicky, Mel Daniels, George McGinnis, Slick Leonard and David Craig. 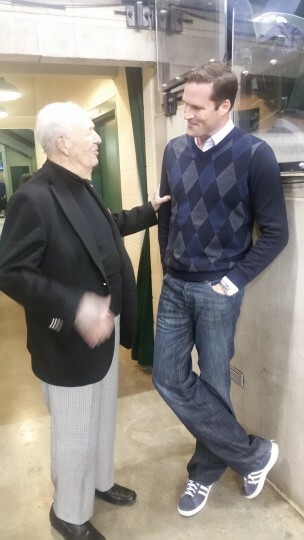 Slick Leonard and Austin Croshere. 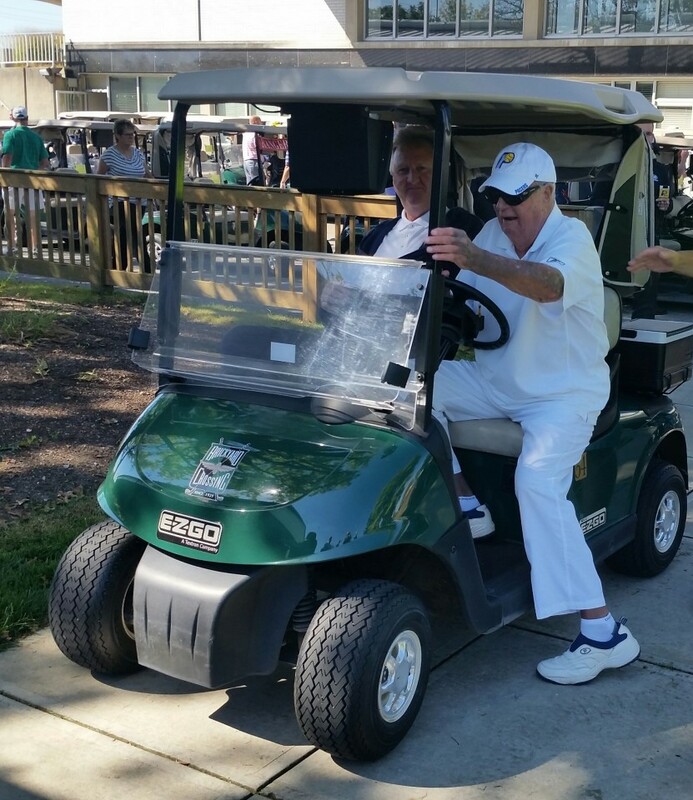 Larry Bird and Slick Leonard, at the Pacers golf outing in 2015. 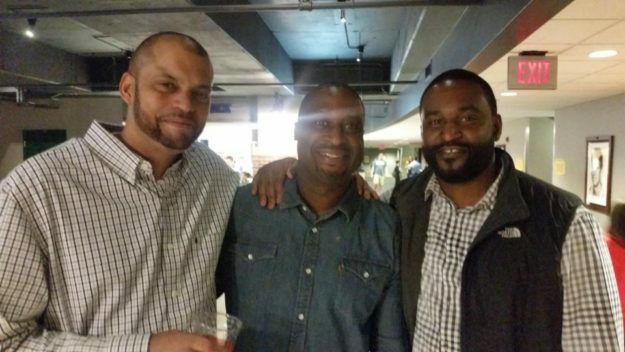 Three former Indiana Mr. Basketballs, at a Pacers game in 2017. Jay Edwards (1987), Woody Austin (1988) and Lyndon Jones (1987). 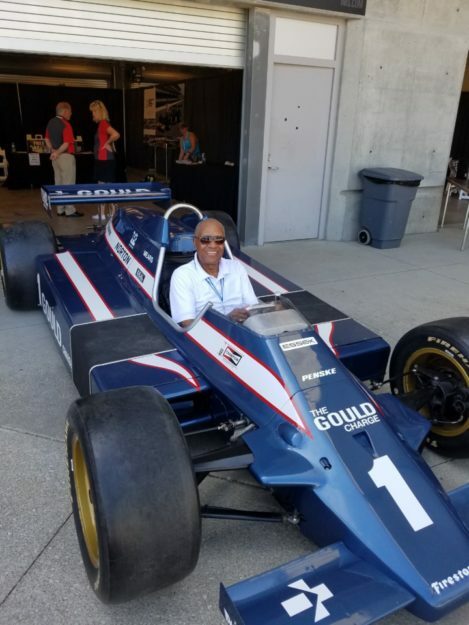 Jerry Harkness, a member of the original Pacers team, squeezed into a car at the Indianapolis Motor Speedway in 2017. I had lunch with Harkness and the Pacers' first media relations director, Bill Marvel, that day. 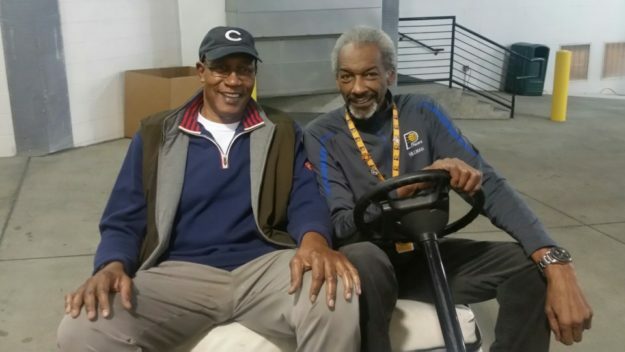 Former Pacers teammates George McGinnis and Darnell Hillman. They once owned an appliance store together. It didn't last long. Their friendship has. 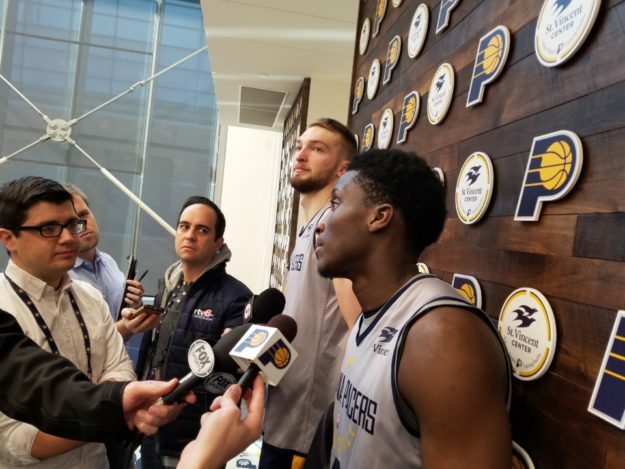 Newly-acquired Pacers Victor Oladipo, Domas Sabonis and Darren Collison met with the media in July, 2017. Team president Kevin Pritchard is left, and coach Nate McMillan at right. 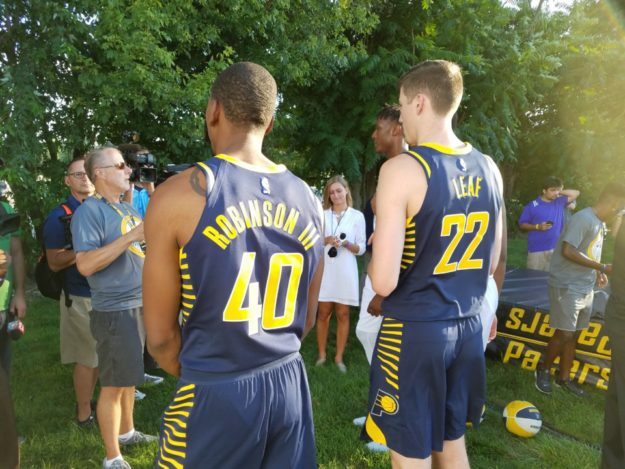 Glenn Robinson III and rookie TJ Leaf model the latest Pacer uniforms in July of 2017. 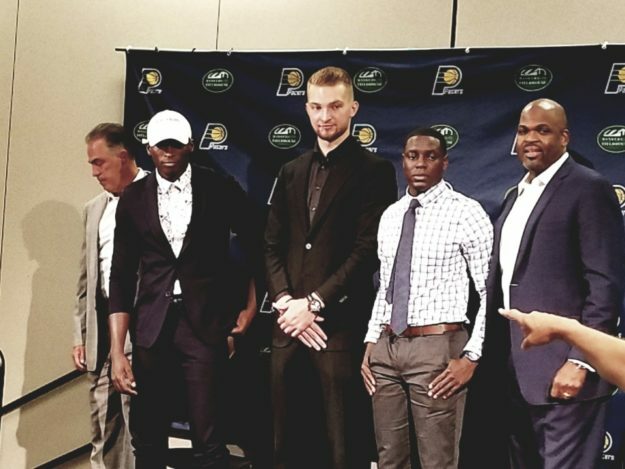 Victor Oladipo and Domantas Sabonis have been traded together twice, to Oklahoma City and to the Pacers. They joined forces for a post-practice interview during the 2017-18 season. 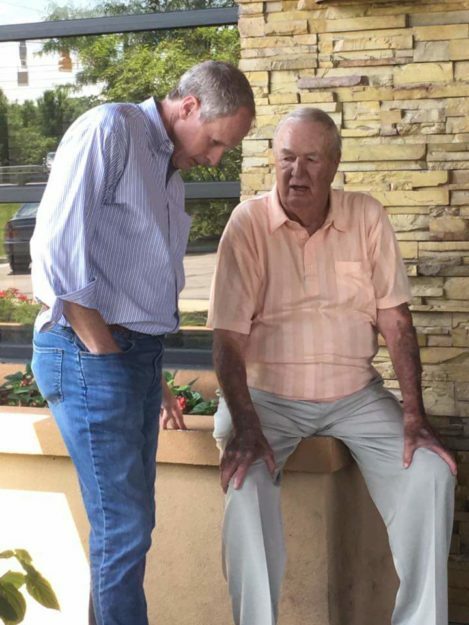 I'm talking with Slick Leonard outside of Seasons 52 after arranging a luncheon in May of 2017. We were talking about how many Indiana high school basketball players are in the Naismith Hall of Fame. 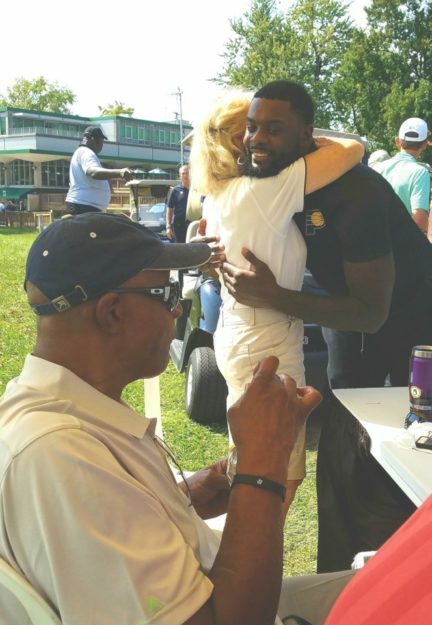 Nancy Leonard greets Lance Stephenson at the Pacers annual golf outing in September of 2017. 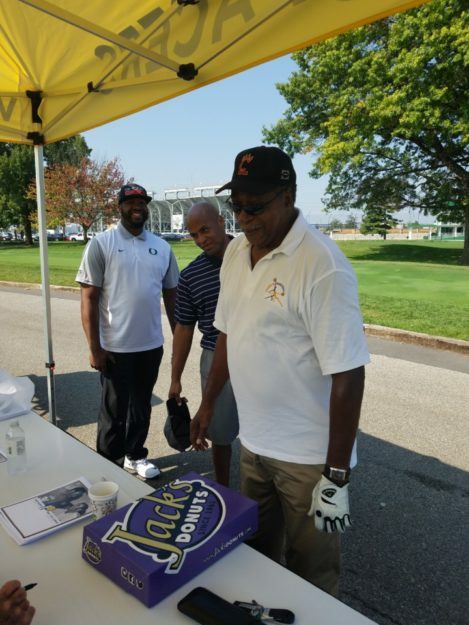 Three former players at the Pacers golf outing in 2017: From front to back: Tom Thacker, Eddie Gill and Fred Jones. It's always interesting when different generations of athletes gather. 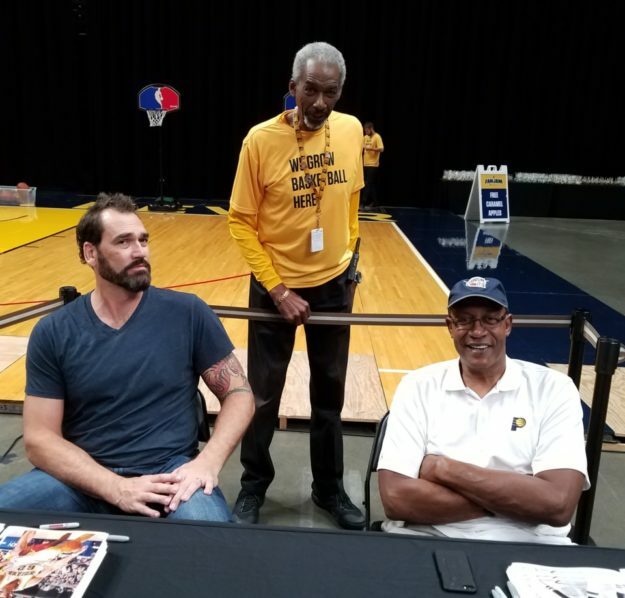 Scot Pollard, Darnell Hillman and George McGinnis signed autographs at Fan Jam in October of 2017. 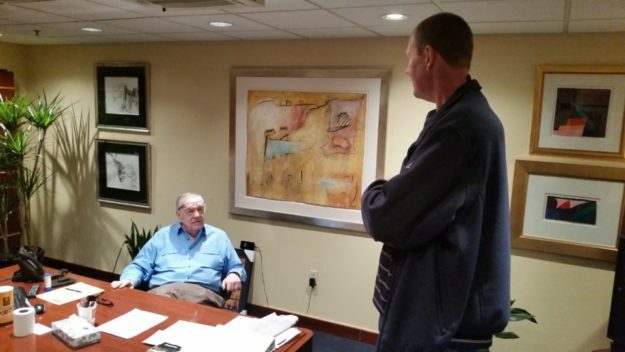 Rik Smits stopped by to visit with Donnie Walsh after Smits recorded a podcast with me during the 2016-17 season. Walsh drafted Smits with the second overall pick in 1988. 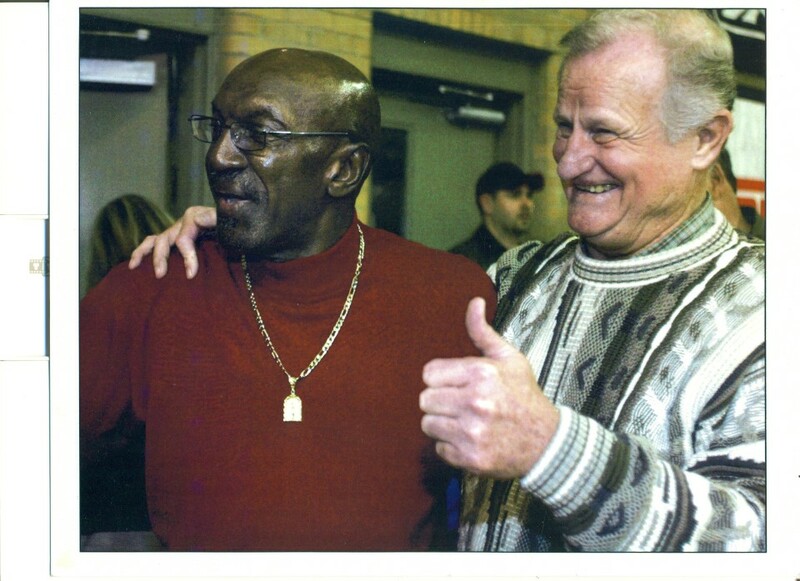 This is a photo of a photo of my Uncle Bob Lemen, with Jesse Owens. 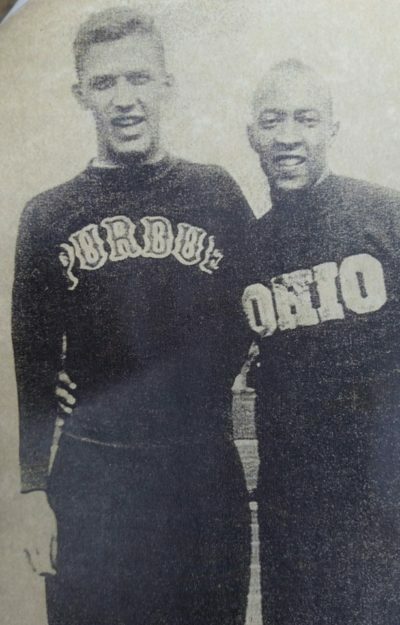 Uncle Bob was a Big Ten hurdles champion at Purdue, but was no match for Owens. Uncle Bob used to joke, "I stayed right with Jesse - until the starter fired his gun."